San Bernardino County Animal Shelters in Devore and Big Bear will be a part of Clear the Shelters, a nationwide campaign to find loving homes for dogs and cats. Participating animal shelters across the country will have reduced adoption fees on August 15 in an effort to increase pet adoptions. The San Bernardino County shelter in Devore at 19777 Shelter Way in San Bernardino and in Big Bear at the Northshore Road/Stanfield Cutoff will have $20 adoption fees for dogs and $10 adoption fees for cats. Animals aRe First Fund will cover remaining adoption cost, spay or neuter, microchip, and initial vaccinations for each dog or cat adopted. Licensing fees will vary based on the adopter’s city of residence and each new adopter will be responsible for the licensing fees. NBC4 Southern California and Telemundo 52 teamed up with nearly 50 animal shelters in more than 400 cities and regions throughout Los Angeles, Orange, Riverside, San Bernardino and Ventura counties on a first-of-its-kind pet adoption initiative. The Clear the Shelters effort is part of a nationwide campaign with 11 NBC-owned stations, 17 Telemundo-owned stations, the NBCUniversal-owned regional news network and more than 300 local animal shelters across the country working to match up thousands of homeless pets with new homes. The initiative marks the first time that the NBCUniversal owned television stations have joined forces on an initiative like Clear the Shelters. 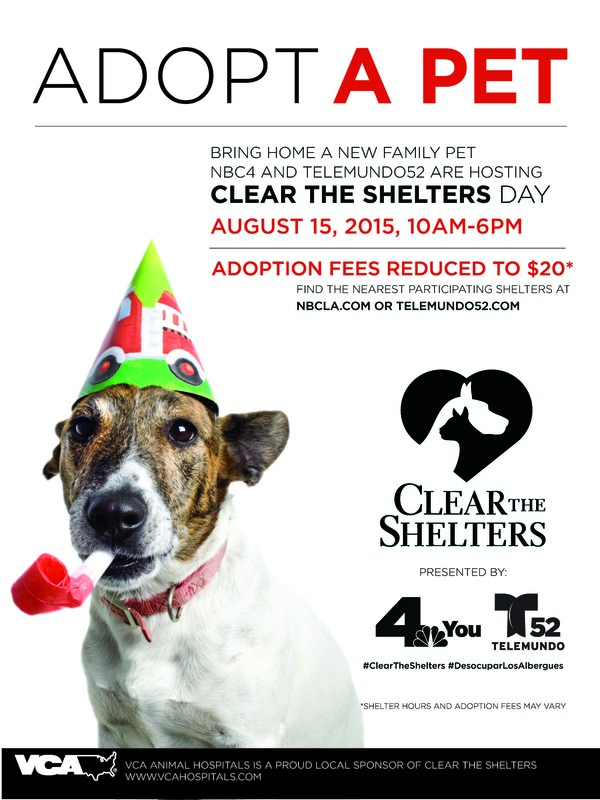 For more information about Clear the Shelters and a list of participating shelters, visit www.NBCLA.com/cleartheshelters. For more information, please call the San Bernardino County Animal Care and Control Program at 1-800-472-5609 or visit www.sbcounty.gov/acc. Animal Care and Control is doing its part to help the community achieve the Countywide Vision by ensuring public safety, public health, and the happiness that comes with responsible pet ownership. Information on the Countywide Vision can be found at www.sbcounty.gov/vision. I always love hearing about pets finding good permanent homes. It is a great idea for these shelters to have events like this. That is definitely something that will attract a big crowd. Pets like this are so precious. That is why it is so important for us to take really good care of them.